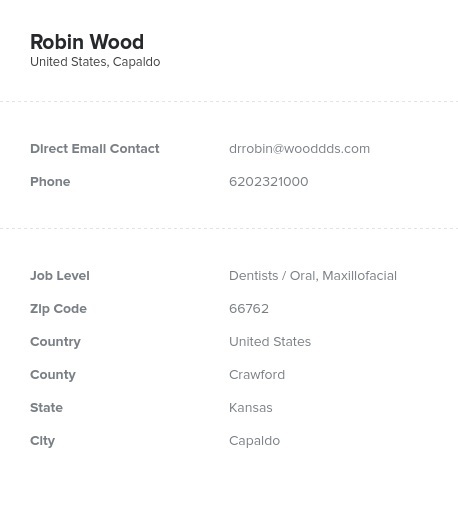 Find and contact dentists' offices throughout the US with the help of our accurate, human-verified dentist database. This dentist email list contains everything you need to connect: email addresses, numbers, postal addresses, names, and more! With this affordable dentist database from Bookyourdata.com, you can reach out to dentists in the US and find the people who make their patients smile. Use this dentist mailing list to find contact information and more effectively market your dental products and services. This list of quality sales leads pulls together a varied and spread-out group together into one organized, consolidated dentist directory. Dentists treat the teeth of patients young and old, recommending healthy dental hygiene practices and sometimes performing minor surgeries. They need an assortment of specialized tools, supplies, products, and medical equipment to help them do their jobs most effectively. Using our verified dentist email and mailing list, you can market a wide variety of dental products: X-ray machines, toothpaste and toothbrush brands, pharmaceuticals, mouthwash, dental tools, and more. This targeted dentist email list is one of our pre-built contact directories; it's ready to download immediately after purchasing. Buy this accurate dentist email database and start marketing to dental professionals and networking with highly qualified dentists across the US. Note that this is a location-based list, specific to US-based dentists; if you'd like to email dental leads in other locations outside of the US, consider creating a custom (B2B) marketing list with our list-builder tool. Find dental contact information easily after downloading this list. Get this premium dentist contact list at an affordable price now and promote your business to relevant specialists!